Engaging an audience of several hundred people, the panel highlighted the value of cybersecurity education and discussed ways to increase government-industry collaboration in the face of increasingly sophisticated threats in cyberspace. 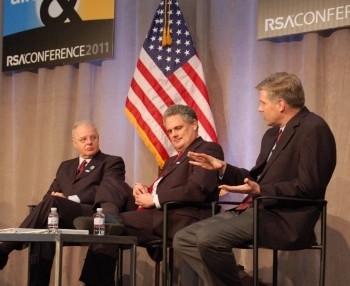 Collaboration "is critical to winning the future," Schmidt said. "From everyday users to specialists who tackle our most challenging questions, the goal is to get everyone pulling in the same direction." The panel also addressed a new Obama administration initiative to make the online environment more secure and convenient – the National Strategy for Trusted Identities in Cyberspace. To be led by the private sector with coordination by the Commerce Department, the effort aims to develop voluntary identity credentials that limit the amount of personal information consumers must share online. Consumers could use the credential – a smart card, digital software certificate in their cell phone or other technology – to prove their identity for sensitive online transactions like banking or checking health care records. For surfing the Web, blogging, or other activities, they could remain anonymous. "At NIST, just about every activity is done in conjunction with the private sector," Gallagher said. "It is the way we do business."